SDS-PAGE analysis of HSP70 (low endotoxin) (human), (recombinant): Lane 1: MW marker, Lane 2: 1µg, Lane 3: 2µg, Lane 4: 5µg HSP70. 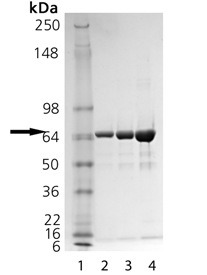 Western Blot Analysis of HSP70 (low endotoxin) (human), (recombinant): Left blot probed with HSP70 mAb (Prod. No. ADI-SPA-810) - Lane 1: MW Marker, Lane 2: HeLa lysate (Prod. No. ADI-LYC-HL100), Lane 3: Heat-shocked HeLa lysate (Prod. No. ADI-LYC-HL101), Lane 4: HSP70. 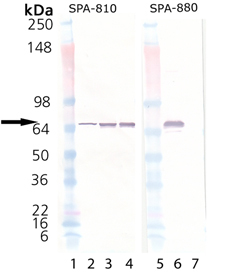 Right blot probed with DnaK mAb (Prod. No. ADI-SPA-880) - Lane 5: MW Marker, Lane 6: DnaK (Prod. No. ADI-SPP-630), Lane 7: HSP70.